In a fight that many thought would not be made, Vasyl Lomachenko will face off with Guillermo Rigondeaux at Madison Square Garden in New York on December the 9th. In this scheduled 12-round bout, the WBO World super featherweight title that is currently held by Vasyl, will be on the line. There should not be as much of a chance of a clash of heads or feet getting tangled up on this night, as both men are southpaws. Loma is a two-time Olympic gold medalist with an outstanding amateur record of 396-1, fighting in both the featherweight and lightweight divisions. He has a professional record of 9-1, with seven of those wins coming by way of knockouts. His only loss came at the hands of the tough Orlando Salido. He wants to fight, and will not let Guillermo coast to a victory. The bigger, younger, and stronger man, Vasyl is predicting his victory. No surprise there. But he is not really known for getting his knockouts early in the game. Rather, he wears his opponents out and then strikes his winning blows. He did get a first round KO last year against Roman Martinez, but that fighter had been through the wringer in his last three fights before he stepped into the ring with Loma. Do you like to bet boxing? Here are the odds for Lomachenko vs Rigondeaux: Lomachenko is the betting favorite and you can get odd’s as little as 1/5. Rigondeaux is an excellent fighter and has a real chance of winning, with odds of 3/1 – it’s worth thinking about betting on The Jackal. 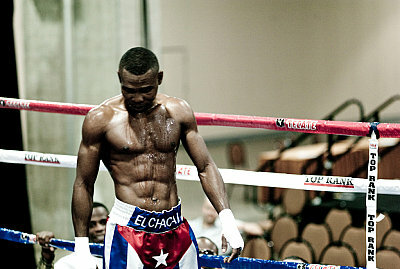 The undefeated Rigondeaux has won 17 fights, 11 by knockout. But not to be outdone by Loma, he has quite the amateur record as well. Guillermo also won two gold medals in the Olympics, his coming in the bantamweight division. His amateur record stands at approximately 475 fights with just 12 losses. As of November he is considered the world’s best active super bantamweight by The Ring, Transnational Boxing Records Board, and BoxRec. The two key words in that sentence is super bantamweight. Here he is fighting for the super featherweight title. Might that alone be enough of a difference? At 37 years of age he is also a lot longer in the tooth than the 29-year-old Loma, but he does not have an active style that might wear out his legs early on. A counter-puncher, Guillermo waits on his opponent to come to him, a style that many fans feel is very boring to watch. The chances are that he won’t have that luxury in this fight, however. If Rigondeaux does not come forward during the entire fight he probably has no chance at beating Vasyl. He did look great in his last fight back in June, knocking out Moises Flores in the opening round. But that victory was overturned when it was determined that Guillermo’s knockout punch came after the bell ended the round. Still, with everything he showed in those short three minutes, he demonstrated that he could take it to an opponent when necessary. And in this fight, it will be needed. But one thing that is most certainly a given is that neither fighter will want to fight to go into the hands of the judges. With the continuing questionable – if not out-right bad – scores of the past year, nobody in either corner would want to take that chance. I expect this to be a more active fight than we generally see from Rigondeaux, which will make it a good one. Enjoy! If you would like more boxing betting tips on the fight please visit our betting section or visit our friends at Odds Digger.